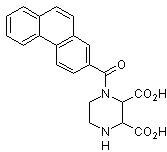 Potent GluN2C/GluN2D (formerly NR2C / NR2D)-preferring NMDA receptor antagonist. (Ki values for recombinant rat receptors are 0.096 (NR2C), 0.125 (NR2D), 0.55 (NR2A) and 0.31 μM (NR2B)). There are currently no Customer reviews or Questions for ab120047.